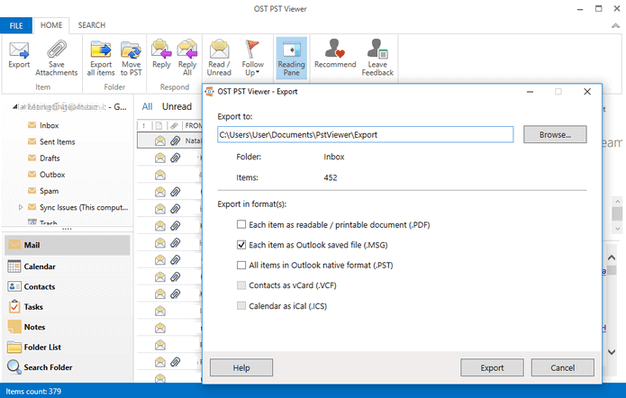 The updated version of OST PST Viewer will open OST and PST files which are connected to Outlook even with the latest 2018 Windows October Update. The update includes a new feature – printing Outlook items. Viewing items without Outlook performance was greatly improved – now more than 1000 items can be viewed. A lot of other functional updates and issues were resolved. Ability to print files from application. Recurrent calendar events are properly displayed. Other minor or cosmetic bug fixes. The purpose of this update was to fix the issue of orphaned OST files opening in read-only mode and users not being able to “Export” to any format even if Outlook was installed on machine.Also, several other issues were fixed. Orphaned OST files could not be converted even if Outlook was installed. PST Viewer not set as default PST and OST files opening program on Windows 10.